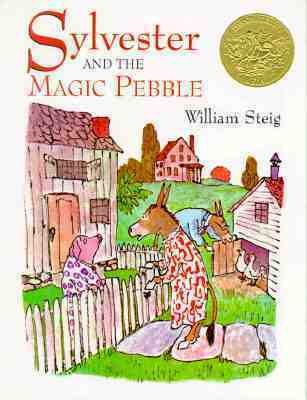 Sylvester and the Magic Pebble written and illustrated by William Steig and Caldecott Award Winner in 1970, tells the story of a family of donkeys who go on a picnic where Sylvester finds a magic pebble, unfortunately he is surprised by lion and Sylvester wishes he was a rock so the lion won’t notice him. His parents don’t realize what has happened and they spend months looking for him. In the meantime, Sylvester feels only rain, snow, and sunshine on his back and eventually falls into a deep sleep on the hill. He is only awakened when one day his parents go on another picnic and remark that they don’t remember seeing that rock before. Then they find the same magic pebble and wish they had their son back. All the while, Sylvester doesn’t realize that the pebble is on his back, but he can hear his parents talking and wishing that Sylvester were there to enjoy the beautiful day with them. Sylvester wishes the same thing. Suddenly the rock wakes up and turns into Sylvester right before their very eyes. They are so astonished and overjoyed, but they hide the pebble away so that no one can accidentally make another wish. 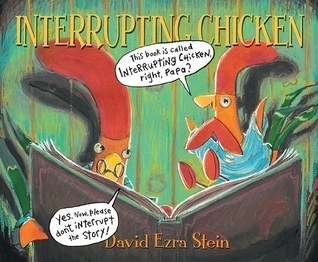 This is a wonderful story of love and family. Young readers are enchanted with the magic pebble. My students used to write down their wishes before we read the story and then we talked about what wishes were really important and how Sylvester probably could have made some smarter wishes when he was facing the dangerous lion.